Foliar feeding nutrients to forage crops for improving yield and quality is a practice that is gaining in acceptance, especially among organic dairy producers. However, very little has been done to quantify the effectiveness of this practice. Researchers at The Ohio State University (OSU) set out to evaluate the effectiveness of foliar fertilizer applications on four organic dairy farms using seven different fields. Douglas Doohan, a professor at OSU, and Louceline Fleuridor, one of his master’s degree students, recently summarized the study in OSU’s C.O.R.N. newsletter. 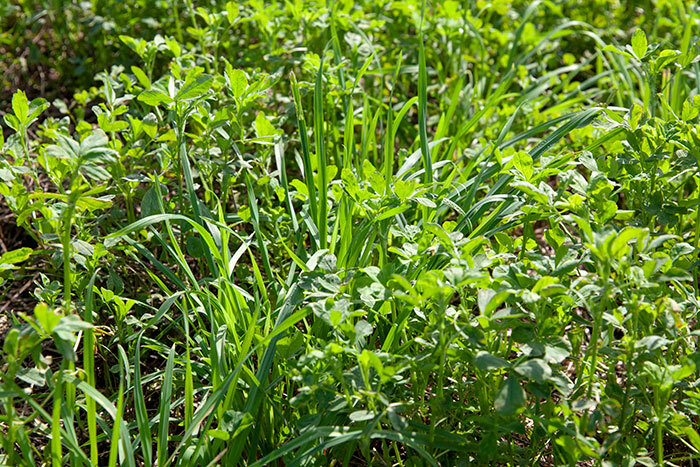 In 2018, field plots in alfalfa-grass mixed fields received applications of organic manure in the fall and spring and no foliar fertilizer (control treatment). The second treatment included the same manure applications plus a blended foliar application of a commercial 5-0-0 (1 gallon per acre) and 5-1-12 (2 gallons per acre) liquid fertilizer, which was applied at first green up and 10 days after each cutting for up to three applications. Plant samples were collected following the treatment applications, but before the next cutting. Data collected was used to estimate forage yield, in-field plant health, and forage quality parameters such as crude protein, aNDF (acid neutral detergent fiber), and RFQ (relative forage quality). Soil and tissue samples were also analyzed for mineral content before and after the growing season. The researchers concluded that foliar feeding had no effect on yield or in-field plant health for any of the sites or cuttings. “While a few forage quality parameters were significantly higher or lower than controlled areas, the inconsistency across sites and cuttings limited the inferences that can be made,” the authors further explained. Organic dairy farms face the challenge of not being able to use many of the traditional fertilizer products available to nonorganic forage growers. They also must keep production costs as low as possible to stay competitive. Because most foliar feeding recommendations come from business owners or other farmers with little to no scientific backing, the authors suggested that more research is needed to further the understanding and validity of this practice. Based on this research and other previous studies, it does not appear that using a relatively low application rate of foliar fertilization on mixed forage stands is a feasible means of improving forage yield and quality. Kassidy Buse was the 2018 Hay & Forage Grower summer editorial intern. She is from Bridgewater, S.D., and graduated from Iowa State University with a degree in animal science. Buse is currently attending the University of Nebraska-Lincoln pursuing a master’s degree in ruminant nutrition.